“Run, Ran Run” is a present, past tense and past participle of a synonym of time. The exhibition showcases works by Singaporean artist Tan Seow Wei and Taiwanese artist Chang Hui-Fang. Despite the different use of mediums from both artists, the show will look athow time has etched its mark on physical space as well as on the human face. The works in the exhibition are united by the concept of elements and documentation of time. 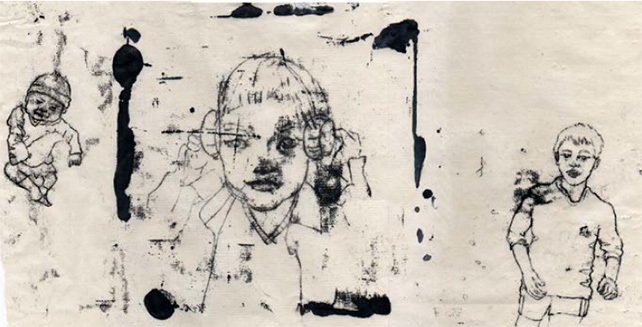 Tan Seow Wei presents a series of monoprints, intrigued by the stories about the past and the drastic changes in the process of aging. The works depict intimate impressions of people around us in the pastand present, juxtaposed with complexities of growing up and growing old on human faces. It merges both worlds from a third-party perspective and her observations of how time has made its mark over the years. Constantly travelling back and forth from Singapore to Taiwan, Chang Hui-Fang engages with herself with a fresh pair of eyes observing her new environment, moving to different living spaces and the speed of time. Alongside a series of oil paintings since 2014, she captures the blurred impressions of physical spaces in Singapore on a canvas. After migrating from Taiwan, she currently undergoes the process of creating a new life/identity for herself and a newfound demand for artistic creation.